Dimension Films (via IMDb) has debuted a new poster for the upcoming Frank Miller’s Sin City: A Dame to Kill For which you can check out in the gallery viewer below! 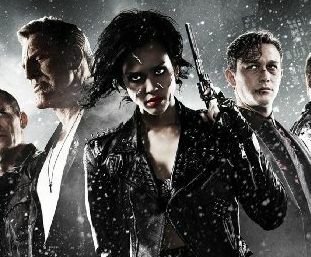 Opening in theaters on August 22, the film stars Mickey Rourke, Jessica Alba, Josh Brolin, Powers Boothe, Joseph Gordon-Levitt, Bruce Willis, Eva Green, Dennis Haysbert, Martin Csokas, Rosario Dawson, Jamie Chung, Jamie King, Alexa Vega, Julia Garner, Christopher Meloni, Jeremy Piven, Ray Liotta, Juno Temple, Christopher Lloyd, Stacy Keach and Jude Ciccolella. Co-directors Robert Rodriguez and Frank Miller reunite to bring Miller’s visually stunning “Sin City” graphic novels back to the screen. Weaving together two of Miller’s classic stories with new tales, the town’s most hard boiled citizens cross paths with some of its more notorious inhabitants.